Hello. My name is Ed and I’m a tech geek. I thought I would get that confession out of the way first. Of course, those close to me already know that about me. This post will be evidence enough that I really am a tech geek. Desktop system monitoring is something that can be used as a badge to show off just how geeky you are but in all actuality, it can be very useful. 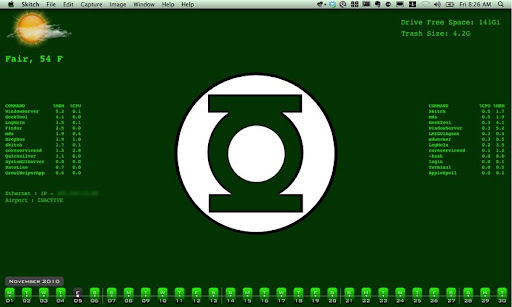 Behold the badge of my geekiness with this screenshot of my MacBook OS X desktop using GeekTool. As you can see there are some useful monitors on my desktop that gauge my memory, CPU and drive space. 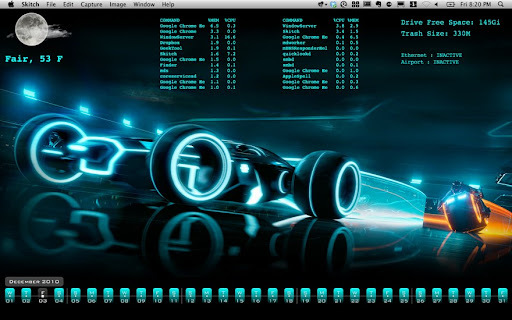 Just in the past few months since that last Tron Legacy screenshot I have also added a fan speed monitor of my MacBook. The calendar portion at the bottom, though, is not part of GeekTool and can be found here as a free download. The easiest way I have found to configure GeekTool is by installing Geeklets. Basically, they are preconfigured scripts to add to GeekTool to give you the monitors you see on those screenshots. Now as you see above I have a pretty basic desktop on my MacBook. There are some guys and gals out there that have done some AMAZING desktops as evident on this page. I especially like the comic book strips toward the middle; more so, the desktop monitor story as told by the Buffy comic. Look closely at the dialog. Now over on the Linux side we have something called Conky. I had heard of the utility before but had never used it until today. The guys over at Web Upd8, the Ubuntu/Linux blog, posted a really cool article on Conky Lunatico Rings that someone created over at Gnome-look.org. I followed the instructions posted on Web Upd8 and configured my own version with a green color scheme instead of the orange using Andrew’s ‘no wireless’ tweak found in the post and posted a brief video to display my desktop. The video quality isn’t so great, I know, so I apologize. Here is a closer screenshot to get a better view. Other than the color, I was also able to change the position as the default was more toward the middle of my display and I changed the disk monitor from used space to free space. For Windows users out there you are probably wondering if there is anything like this for you, and there is. I’ve not used them so I’m not too familiar with them but go check out Rainmeter and Samurize.